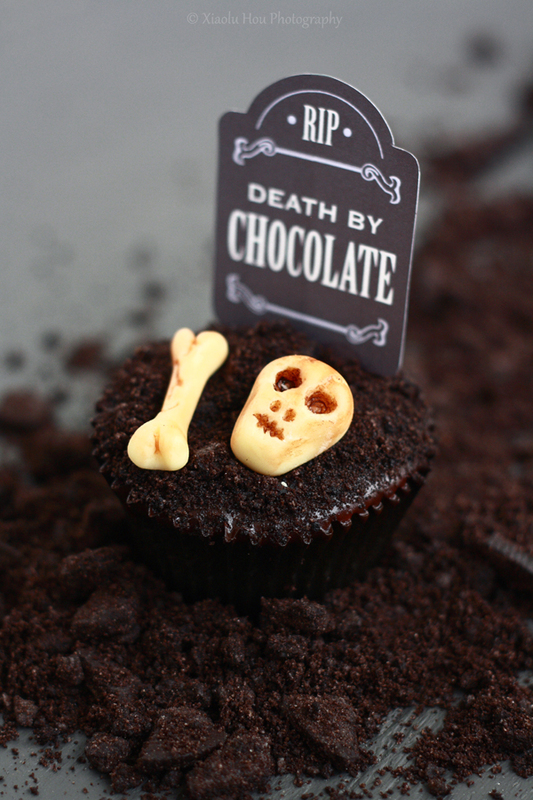 You can get the recipe for Xialou’s vanilla cookies n’ cream cupcakes and instructions on how to create the skull and bones fondant toppers at Pure Joy Events. Thanks so much, Heather! It's always so much fun collaborating with you and the toppers you designed were PERFECT! How cute is this! Remember this for my Halloween-Party this year. Thank you. Hi! I love these cupcake toppers!!! 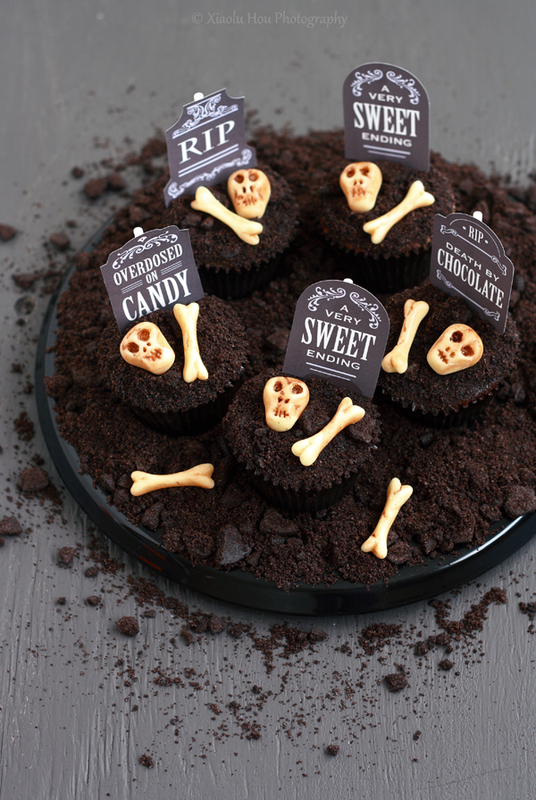 I love Halloween & have a 'Spooky Dinner' every year & these will be perfect...thank you! I have a question, though, my daughter's teacher if turning 40 this week & we are making a big deal out of it. I am making cupcakes & only wanted to use the RIP topper. I thought I'd just crop out that one & make a page full of those to print 40. There is a password & I am not able to...is there any way to just get the RIP one? I don't want to print 40 of all of them, I won't even be able to use all of the leftovers at my dinner if I print that many. Hi Sara! Email me at heather (at) chickabug.com. Thanks so much - these are great! Thanks so much for these, I'm going to use them at my Daughters Halloween Sleepover! pinterest. These are great, thank you. Awesome! That's JUST what I was going for. ; ) Thanks Jen! Would love to open the PDF and print but sadly I cannot. The PDF reader reports a password is required. Is there any way to get this password? Thank you for sharing these. They are absolutely wonderful! Hi Katie, You can download them by clicking on the link in the post. I hope this helps! Are these toppers no longer available? The cupcake and fondue recipes seem to be '404 - page not found'. Any alternate suggestions? Thanks! These toppers are great! 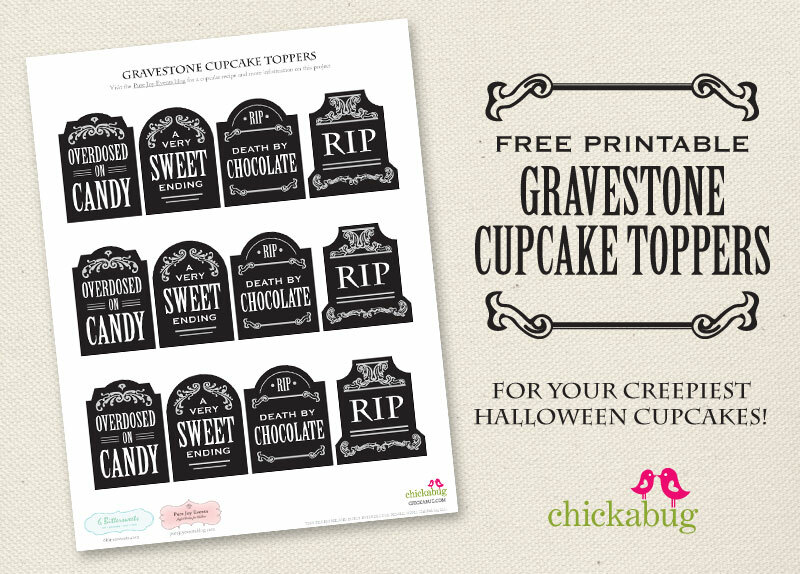 can the gravestone toppers be used for small home business (commercial) use? These cupcakes are so cute! my kids are going to love them. Hi Viola! You can sign up for my VIP List in the post or in my sidebar. Once you do, you'll get a welcome message with instructions for downloading. Thank you! love your tombstone printables, thanks! this is such a great idea! so doing this! Hello would love to download your halloween toppers. thanks for the blog!! Hello, I signed up for the VIP mailing but never received an email nor this free printable. I need them for a holiday party this afternoon - everything else is made. Can you please send it to me? Hi Becky! The email was sent 3 times to your gmail. Please check your spam folder for an email from shop (at) chickabug.com. Thanks! The tombstone toppers look fun. Hi Kimberly! Looks like you got the email and clicked on the link in it, so you should be ok. If not, just let me know. Thank you! I love free stuff, thanks! Hi, loved your graveyard idea. Can I get a link to download the graveyards. Thank you so much!! I love all your stuff!